Wire Decking Styles - Warehouse Solutions, Inc.
Wire Decking comes in many different sizes and styles and choosing the right style for your application can be challenging at times. 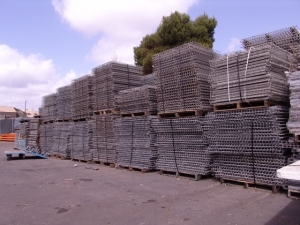 Warehouse Solutions Inc. has created this guide to help you decide which wire deck style is best for the type of pallet racking you have or will soon be purchasing. Of course the easiest way to figure all of this out would be to contact a Warehouse Solutions Inc. Sales Engineer and let them do all that work for you. 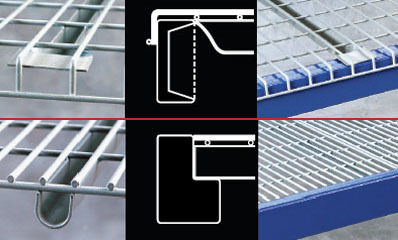 A Box or “C” Channel Waterfall Wire Deck uses a flattened end to rest on top of the beam surface. It also has a waterfall edge to keep the deck securely on the beam and holds it into place. This creates a partially unobstructed view of the beam face for reading the labels and product barcodes. This image shows a “U” Channel cross support that has been flattened at the end so it can rests on the top on the box beam. This adds to the strength of the Wire Deck. The more Channels a deck has the more it can hold. A typical wire deck comes with 3 channels and larger ones will have 4. The Waterfall edging helps create a snug fit and add extra strength to the deck. A Standard or Step Waterfall Wire Deck rests on the step part of the beam while part of the decking rests on top of the beam. The edge of the deck hangs over the face of the beam for added support. The step carries the weight of the decking and its contents across the surface area of the step beam. This image show a “U” Channel cross support that rests on the step as well. This adds to the strength of the Wire Deck. The more Channels a deck has the more it can hold. A typical wire deck comes with 3 channels and larger ones will have 4. The face of the decking creates a partially unobstructed view of the entire beam face for reading the labels and product barcodes. Flush No Waterfall Wire Decks rest on the step part of the beam and stays flush with the beam’s surface. This step carries the weight of the decking and its contents across the surface area of the step beam. This creates an unobstructed view of the entire beam face for reading the labels and product barcodes. This image show a “U” Channel cross support that rests on the step as well. This adds to the strength of the Wire Deck. The more Channels a deck has the more it can hold. A typical wire deck comes with 3 channels and larger ones will have 4. Flush Inside Waterfall Wire Decks rest on the step part of the beam. This step carries the weight of the decking and its contents across the surface area of the step beam. This creates an unobstructed view of the entire beam face for reading the labels and product barcodes. This image show a “U” Channel cross support that rests on the step as well. This adds to the strength of the Wire Deck. The more Channels a deck has the more it can hold. A typical wire deck comes with 3 channels and larger ones will have 4. The Waterfall edging helps create a snug fit and add extra strength to the deck. An Inverted Waterfall Wire Deck also rests on the step part of the beam while part of the decking rests on top of the beam. The edge of the deck hangs over the face of the beam for added support just like the standard. The step carries the weight of the decking and its contents across the surface area of the step beam. This image show an Inverted Channel cross support that rests on the step as well. This adds to the strength of the Wire Deck. The more Channels a deck has the more it can hold. A typical wire deck comes with 3 channels and larger ones will have 4. The face of the decking creates a partially unobstructed view of the entire beam face for reading the labels and product barcodes. 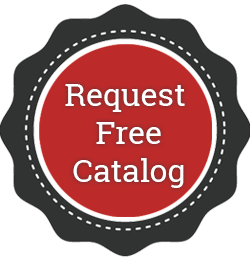 Warehouse Solutions Inc. can special order custom sizes if needed for your specific application. Call us for more information. In the San Diego area call (619) 873-4410 or nationally call (800) 278-1715.